Not too long ago, Samsung began selling their mobile phones direct to consumers here in the United States via either samsung.com or the Shop Samsung App. This was great news as taking out the middleman (carriers) is always welcome. Customers are, of course, still free to buy a carrier-branded phone from any number of carriers of their choosing. However, for a couple of generations now, Samsung themselves have offered an Unlocked (U1) version that’s free of carrier branding, carrier boot screens, carrier apps, and any other entanglements to one’s provider. In fact, the main US Samsung website’s landing page shows the Galaxy S10 with a prominent “Buy Now” button with choices of carrier or unlocked versions. Obviously, selling phones direct is an important task for Samsung. Their unlocked versions are a little different when it comes to updates, however. Samsung handles updates for their unlocked devices very differently than one might expect. 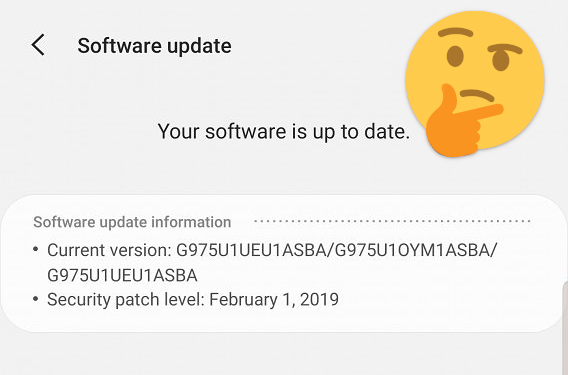 Since at least 2017, software updates for the unlocked flagship devices haven’t been rolling out in the US until after every single carrier has pushed the update. It happened with One UI on the Galaxy S8, then again with the Galaxy S9, and it happened with the Galaxy Note 9 as well. It doesn’t matter if your particular unlocked device has never, and will never, have a Verizon SIM card. Unlocked users all have to wait on Verizon to push out the updates. This sort of behavior is very contrary to what users might expect with unlocked devices. After using a Google Pixel, an Essential phone, a Nokia phone, a Motorola device, a OnePlus device, and even an iPhone, it wouldn’t be unreasonable to expect less carrier involvement with an Unlocked device, and not (in the US) 4 times more. When Apple releases an update, it’s out globally to devices all across the price range. Apple manages to make this work even though local carrier features cause delays for other users. I realize there are obvious architectural differences between Android and iOS, but as a consumer spending over a thousand dollars, I don’t really care about the why. Currently, with the Galaxy S10, it appears T-Mobile and AT&T have pushed the March update. Meanwhile, my $1,600 1TB super-special-ceramic-ultimate-awesome edition is “up to date” with the February security patch. This is very frustrating. It is almost mid-April. I paid Samsung directly for my device. It has a T-Mobile SIM card in it and will never have a Sprint or Verizon SIM card, yet I’m waiting on them to approve an update? My security patches are held back while AT&T does whatever they need to do to make sure their carrier-specific bloatware works with Samsung’s latest update. I’m using a less secure device while I wait on a carrier I’m not involved with. Not to mention all the awesome feature updates that I’m missing out on. Unfortunately, this isn’t entirely unexpected either. My unlocked Galaxy Note 9 wound up receiving the One UI with Android Pie update on March 12th, non-coincidentally the same day that Verizon finally pushed their update. Again, I spend no money with Verizon, have no agreement with Verizon, and a Verizon SIM card has never, and will never, be inside my Galaxy Note 9, yet I still had to wait on them. The first US carrier to release Android Pie was AT&T in early February, Verizon and the Unlocked version took over a month after that. We all know that Samsung’s version updates won’t be quick, but for an OS version that first released in August of 2018, waiting another month after a near 6-month wait felt particularly egregious. Ostensibly, most of this delay will be hand-waved away by Samsung or the carriers as “Carrier Testing.” If you look at Samsung’s FAQ about unlocked phones, they mention supporting “most carrier services such as SMS and mobile hotspot.” Of course that’s positive and desirable, but one still winds up waiting on “compatibility testing” for providers they’ll never use. Also, these long delays seem to only impact the Snapdragon version and not the Exynos offerings. As annoying as this may be for the flagship Galaxy devices like the S series or the Note, users can be reasonably sure that they will at least get the updates eventually on their mainline unlocked devices. For instance, the Galaxy S8 is still (very slowly) getting updates across carriers here. But what does this type of unstated policy mean for boutique devices or limited run, high-cost, low-sales devices? Very soon Samsung will be launching the Galaxy Fold and the Galaxy S10 5G here in the US. Both of these devices will sell in drastically lower numbers than the Galaxy S10 series. Will users who shell out $2,000+ for the most expensive smartphone around have to wait on carrier whims for security updates? If AT&T sells very few of these and thus has absolutely no hurry with updates, will my Unlocked Galaxy Fold be waiting around in limbo for the latest security patch? That’s a tough sell. Samsung has largely succeeded here in the US with the help of its carrier alliances. All parties have benefited greatly from one another. I understand that these are valuable relationships, but as an unlocked device consumer, it feels incredibly frustrating to seemingly be an afterthought. After all, my relationship is with Samsung, not a carrier. Samsung is large and important enough here in the US to have some push back against the carriers. They were able to run an Android Pie beta program on the unlocked Galaxy Note 9 last year, which is commendable. So why would it be unreasonable to use the Samsung Members app to download the March security patch before the unlocked OTA gets pushed, especially since T-Mobile (my SIM card) already released their OTA? When spending $1000+ directly with Samsung for an unlocked smartphone, the experience shouldn’t be worse than a carrier version, and consumers certainly deserve better support.